The Iowa Department of Natural Resources says the deer harvest is running behind, but there is still a chance that the numbers will catch up to last year. Wildlife researcher Willie Suchy says the numbers have been up and down through the various seasons. He says hunters were doing well, and then at the start of the shotgun season, numbers fell behind, but then the numbers caught up again. The numbers are about 4,000 deer behind last year, and that prompted some to call for an extended shotgun season. The D.N.R. extended the shotgun season in 2007, but Suchy says that was because winter weather drove the numbers way below projections. He says weather hasn’t been an impact this year. According to Suchy, the deer harvest fell farthest behind when the weather was the best during the first weekend of the shotgun season. Suchy says there are still plenty of opportunities for hunters to catch up. The late muzzleloader season runs until January 10 and there are typically 20,000 hunters out for that season. 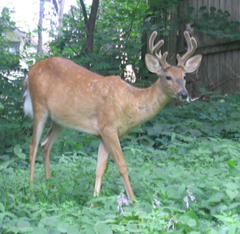 Then there’s the antlerless season coming up in January. Suchy says the number of female deer taken is only about 2000 lower than what they’d like and that is a key measure. Deer numbers have declined the last several years and Suchy says if that continues, what they are doing will get the deer population down to the D.N.R.’s goal. The D.N.R.’s deer population goal has been reached in about 60 counties and Suchy believes the can get there in the other counties in about a year or two. Suchy says there are still plenty of antlerless licenses available in many of the counties where the numbers need to come down. Suchy says hunters took around 140,000 deer last year.